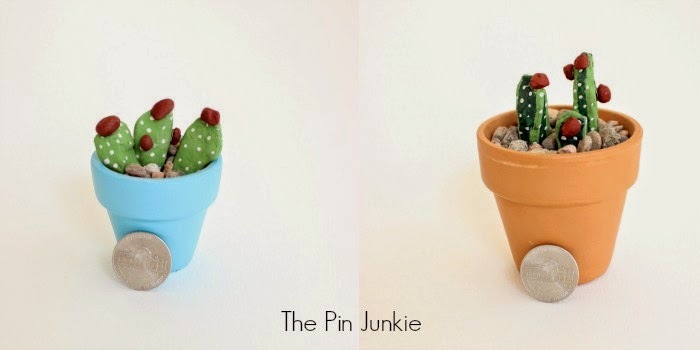 Who knew you could paint rocks to look like a cactus? I saw this pin on Pinterest and immediately got out my paint and brushes and started looking for just the right shaped rocks. These little cacti don't need any watering, but that's not why I like them. They are so darn cute! On a cuteness scale of one to ten, I'd have to say they're an eleven! They're so teeny tiny! Here's a picture with a nickel for scale so you can see just how small each potted cactus is. 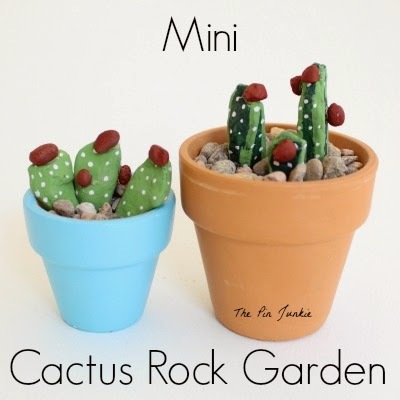 Want to make your own mini cactus rock garden? The first thing you'll need to do is find some rocks. There are a variety of cactus that grow in different shapes, but I wanted to make a prickly pear and a tall skinny cactus so I looked for rocks that would be the right size and shape for what I needed. 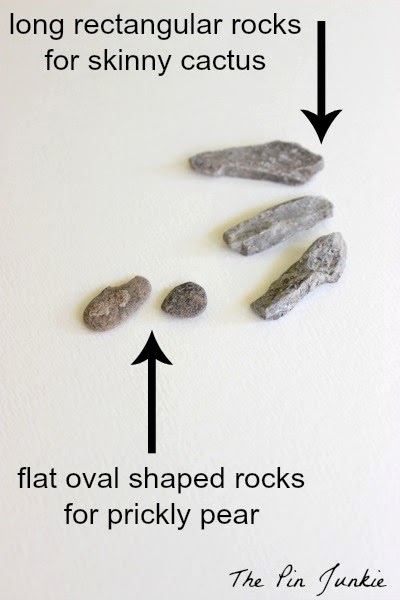 I looked for flat, oval shaped rocks for the prickly pear cactus and rectangular rocks for the tall skinny cactus. Next, I painted the rocks with green water-based acrylic paint and let them dry. 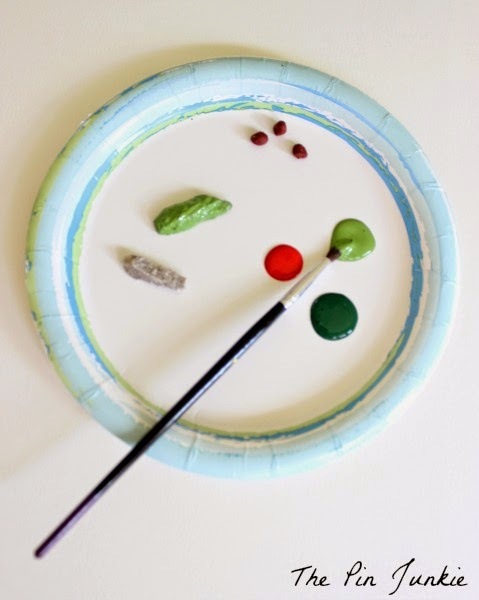 A paper plate makes a great place to work and easy clean up. I also painted some smaller rocks red which I used for the cactus blooms. Once the paint was dry, I used a very fine brush to add some white dots for the cactus spines. Then I glued on the little red blooms. I used a glue gun which worked just fine, but if you could also use an epoxy glue for a more permanent hold. The last step was to fill the pot almost to the top with gravel. I nestled the painted rocks into the gravel and secured them with some glue. Then I add a little bit more gravel to cover up the glue. These cactus are so tiny and so cute, I just love 'em! in the craft project gallery. 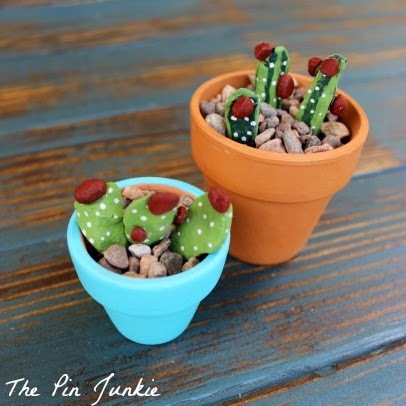 Inspired by this pin for rock cactus garden. wow these are so awesome! love them! We are planning a fairy garden - I know what's going in there now :) You really blow my socks off Bonnie!! What a great idea for using in a fairy garden! I didn't even think of that. Can't wait to see your garden and hope you'll be sharing pictures when it's all finished! This is my kind of garden;) Love this creative idea ... so fun! This is so cute! A perfect project for my nieces. I hopped over from the Do Tell Tuesday link up. Clever idea! 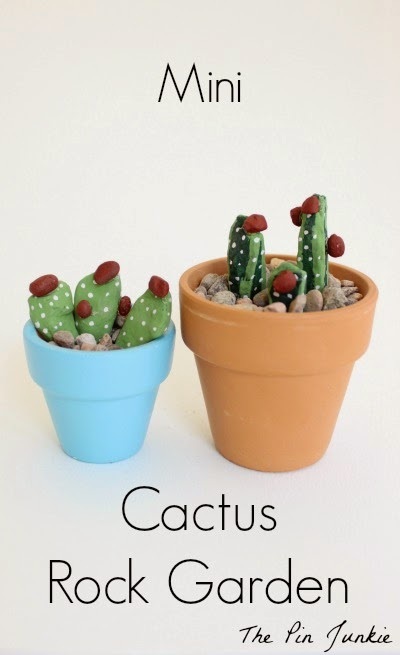 Love your gorgeous cactus garden! Thanks for sharing! I saw your link on ducksnarow.com. I had to look twice because I really thought the cactus was real. That is s great idea. Thanks for sharing. What a fun idea. I know my kids would love gathering rocks to paint. Pretty easy! Thanks for sharing on the Thursday Blog Hop! So cute! They really do look like real cactus. 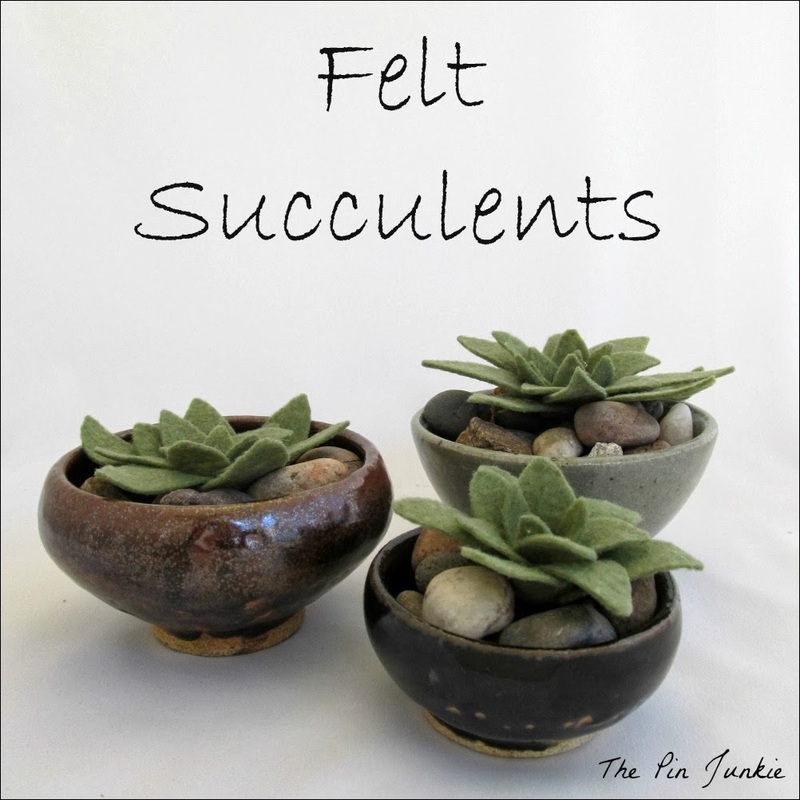 Love the felt succulents too! Thanks for sharing with SYC. Oh how cute...love it!! Thanks for sharing! You are right, they are an 11 on the cuteness scale. You've taken painted pebbles to a new level! Love the cactus rock garden. What a cute idea. I would love for you to share this a my T.G.I.F. Linky Party @ MamasBlogCentral.com Have a great weekend! Love it! The perfect plant!